← Bolivian state-owned companies are doomed to fail under the coca caudillo regime! Students of the Communication Sciences Career at the Universidad Mayor de San Andrés carried out the fieldwork on June 16th. 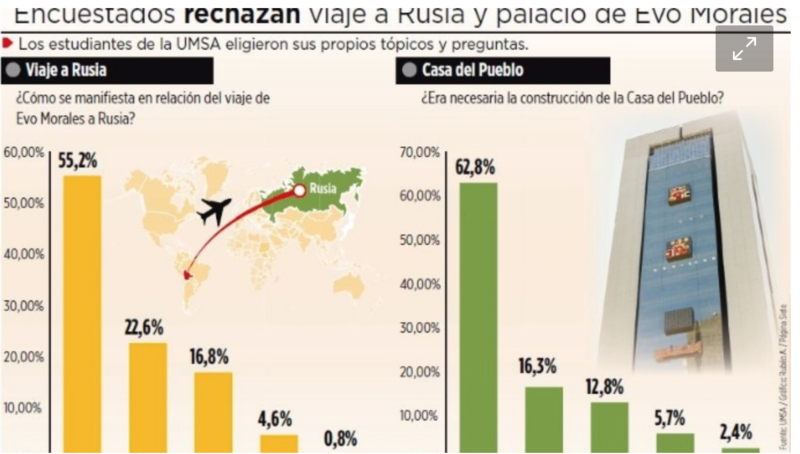 The majority of the population surveyed by students of the Universidad Mayor de San Andrés (UMSA) say they are against the recent trip that President Evo Morales made to Russia. On the other hand, this field work also detected that the majority believe that the construction of the so-called Casa Grande del Pueblo [Big House of the People] was not necessary. The results show that 55.2% are against Morales’ trip to Russia; 22.6% are neither against nor in favor and only 16.8% affirm they are in favor of that journey to Russia. (More detail in the attached infographic). The trip of President Morales to Russia was questioned by the opposition because it was considered that the president used as a pretext the “business visit” only to not miss the opening of the 2018 World Cup, as he did in previous world championships. On June 14, hours before the start of the World Cup, the Head of State met with the executives of Gazprom. However, it was the Minister of Hydrocarbons, Luis Alberto Sánchez, who signed the investment agreements for $1,220 million dollars. That signature, however, ratifies the memorandum of understanding that YPFB signed with Gazprom, seven months ago, in Santa Cruz. 62.8% consider that the construction of the Evo Palace was not necessary and only 16.3% believe otherwise. 12.8% say that “maybe” building was necessary. The construction of the Casa Grande del Pueblo was also questioned by the resources invested in the project and by the “luxury” units it has. The teacher in charge of the survey, Antonio Vargas, explained that these topics were chosen because of the controversy they generated and because they demonstrate the “waste” of the State’s resources. “These subjects were chosen for the waste of public money, money that is used in a trip to Russia, which has absolutely no sense (…). La Casa del Pueblo, for the anguish of cancer patients who need radiotherapy and can not find who can give them this service,” explained Vargas. Team. The survey was conducted on June 16th by a group of 45 students from the Public Opinion seminar of the Social Communication career of the Universidad Mayor de San Andrés (UMSA). Results. Fieldwork has a 5% margin of error and 95% confidence. Other topics. UMSA students also consulted the respondents about the UPEA conflict, the management of the ministers and President Evo Morales, in addition to the 21F.